Serendipity Farm Alpacas & Llamas is An alpaca and llama breeding farm open to the public! located in Lanark, Ontario owned by Keith & Elizabeth Adam. What's Happening at Serendipity Farm? Serendipity Farm and Store are open from 10 a.m. to 4 p.m. on most weekends and holidays throughout the entire year - other days by appointment. EASTER WEEKEND HOURS: Friday, Saturday, and Monday from 10 a.m. to 4 p.m. - CLOSED ON EASTER SUNDAY. 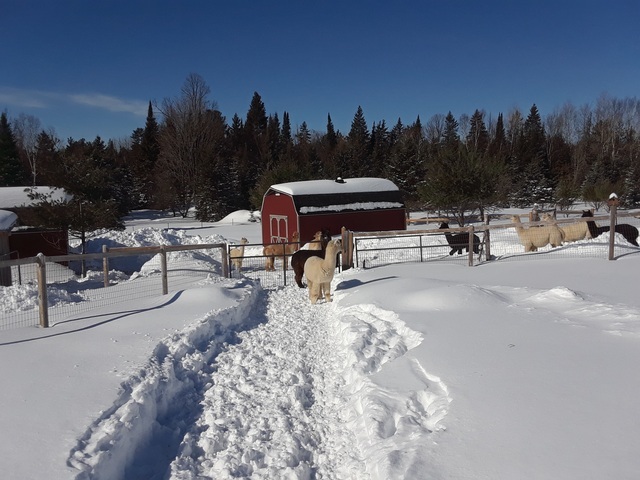 There is NO Admission Fee to visit Serendipity Farm Alpacas & Llamas, however, we are a proud supporter of the LANARK HIGHLANDS FOOD PANTRY and CASH DONATIONS to this charity are accepted at our Farm Store. We currently have an excellent selection of alpacas available for sale, however, we have NO llamas available for sale at the moment. Shearing Day 2019 is on Friday, May 10th! Please visit us on Facebook for the latest Farm and Store news!! "Serendipity" at sunrise - April 2019. A sunny spring-like morning in the girls barn - March 2019. 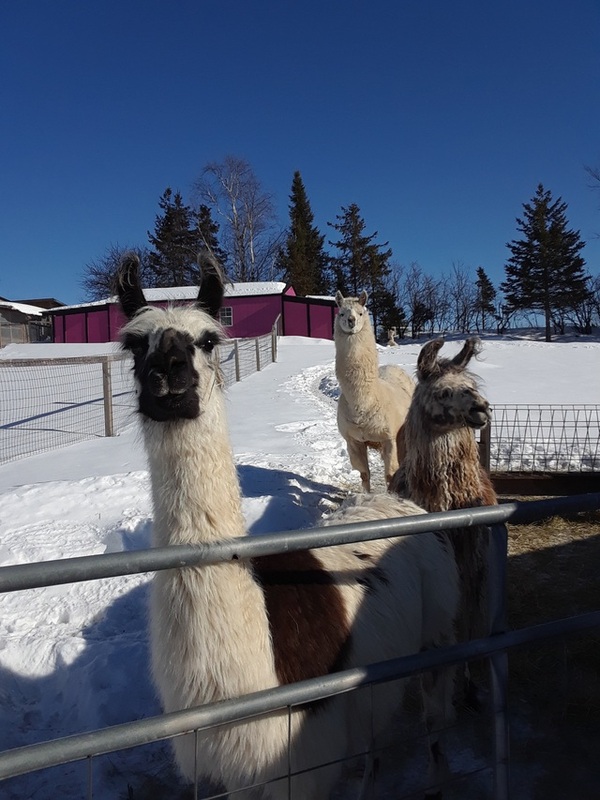 Three of our llama girls enjoying the March 1st warm sunshine! "After the Big Snow" - February 14th, 2019. At Serendipity Farm Alpacas & Llamas our mission is to raise healthy and happy animals; breed for quality fibre while maintaining strong bloodlines; as well as recognizing the value in each and every animal. We are also dedicated to providing information about, and promoting the benefits of, raising camelids in Canada. Alpacas are small animals of the camelid family (other members include llamas, camels, vicunas and guanacos). They were domesticated over 5,000 years ago by the ancient Inca civilization. Their fine cashmere-like fleece was once reserved for Incan royalty. Alpacas produce fiber that is as fine as cashmere, soft, silky and much warmer than sheep's wool, while also wicking moisture away from the body. Alpaca fiber is lanolin-free making it virtually allergen-free! With the exception of mohair, alpacas produce the strongest animal fiber in the world. Their fleece comes in 22 natural colours, the widest assortment of colours of any fiber-bearing animal. Prized for its unique silky feel and superb handle, alpaca fiber is highly sought after by the textile makers of Britain, Europe and Japan. Alpacas have a life span of 20 - 25 years. Adults weight 125 - 200 lbs and stand 34 - 36 inches high at the withers. Baby alpacas, called crias, generally weight 14 - 20 lbs at birth. Gestation is approximately 11 months. As a rule, alpacas are born during the day, usually between 10:00 a.m. and 2:00 p.m. Alpacas communicate through soft humming noises and a unique body language. Today, in Canada, alpacas are raised for their exquisite fiber, and are enjoyed for their delightful personalities as well as the financial returns of raising and breeding them. There are two types or breeds of alpaca, the huacaya and the suri, which differ primarily in the character of their fiber. The huacaya, the most common alpaca breed has a crimped or wavy fleece, whereas the suri has straight, lustrous fiber. In full fleece, the huacaya has a full, fluffy appearance, while the suri is elegantly draped in long, wavy locks. Various worsted and woollen mills in Canada offer custom processing of alpaca fiber into various yarns, fabric and felt. Sweaters, blankets, mitts, socks, shawls, hats and duvets can be purchased through various home-based businesses.